Class ends. Students pack up and head back to their dorms. The professor, meanwhile, goes to her car . . . to catch a little sleep, and then eat a cheeseburger in her lap before driving across the city to a different university to teach another, wholly different class. All for a paycheck that, once prep and grading are factored in, barely reaches minimum wage. Welcome to the life of the mind in the gig economy. Over the past few decades, the job of college professor has been utterly transformed--for the worse. America's colleges and universities were designed to serve students and create knowledge through the teaching, research, and stability that come with the longevity of tenured faculty, but higher education today is dominated by adjuncts. In 1975, only thirty percent of faculty held temporary or part-time positions. By 2011, as universities faced both a decrease in public support and ballooning administrative costs, that number topped fifty percent. Now, some surveys suggest that as many as seventy percent of American professors are working course-to-course, with few benefits, little to no security, and extremely low pay. In The Adjunct Underclass, Herb Childress draws on his own firsthand experience and that of other adjuncts to tell the story of how higher education reached this sorry state. Pinpointing numerous forces within and beyond higher ed that have driven this shift, he shows us the damage wrought by contingency, not only on the adjunct faculty themselves, but also on students, the permanent faculty and administration, and the nation. How can we say that we value higher education when we treat educators like desperate day laborers? 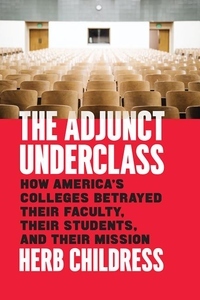 Measured but passionate, rooted in facts but sure to shock, The Adjunct Underclass reveals the conflicting values, strangled resources, and competing goals that have fundamentally changed our idea of what college should be. This book is a call to arms for anyone who believes that strong colleges are vital to society.